c1930. Two-stroke engine. 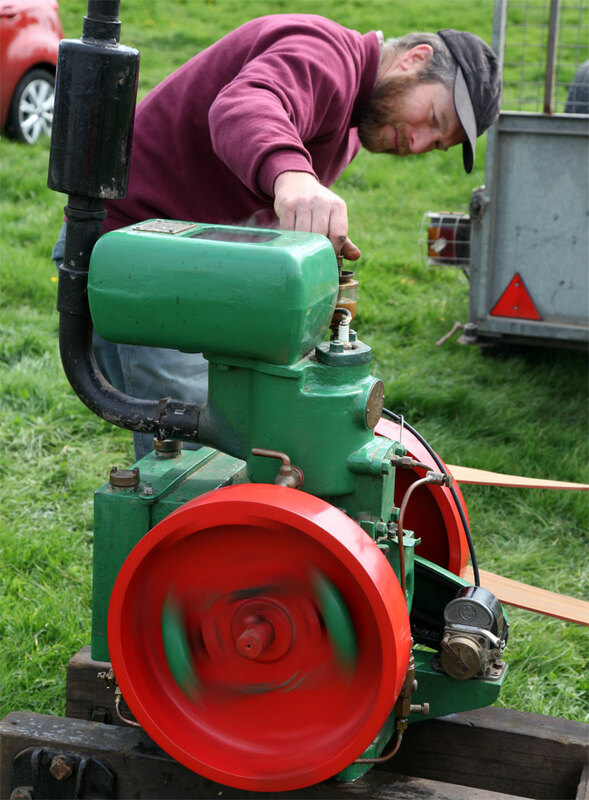 2.5 hp at 650 RPM. No: 30707. 1911 Company founded by Percy Hall (when he returned to the UK from Mexico where he had been involved in looking for oil) as Hall’s Engineering - a marine engine and boat repair business. By 1914 The company name was changed to Hamworthy Engineering Company Limited following its incorporation as a limited company. It had 6 employees. 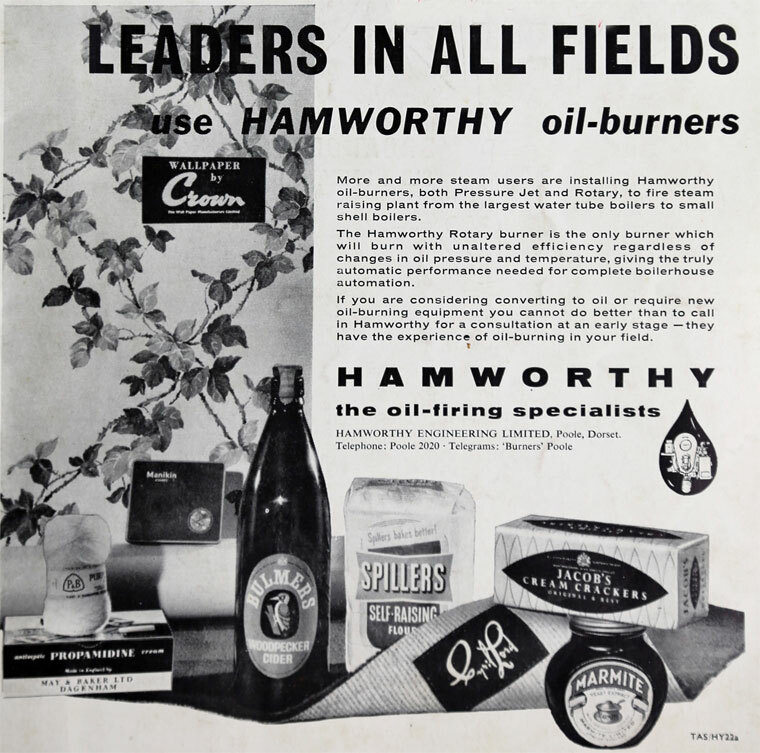 1918 Hamworthy set up its own foundry to guarantee a supply of high quality castings. 1921 The company opened an office at 22, Dean-street, Newcastle and appointed Mr Phillip E. Brittain as the Northern sales manager. 1924 Opened a branch office at 103, West Regent-street, Glasgow. 1927 Opened a branch office at 50 Grainger Street, Newcastle-on-Tyne. 1936 A fire at the main pattern shop effectively ended the production of Hamworthy engines. 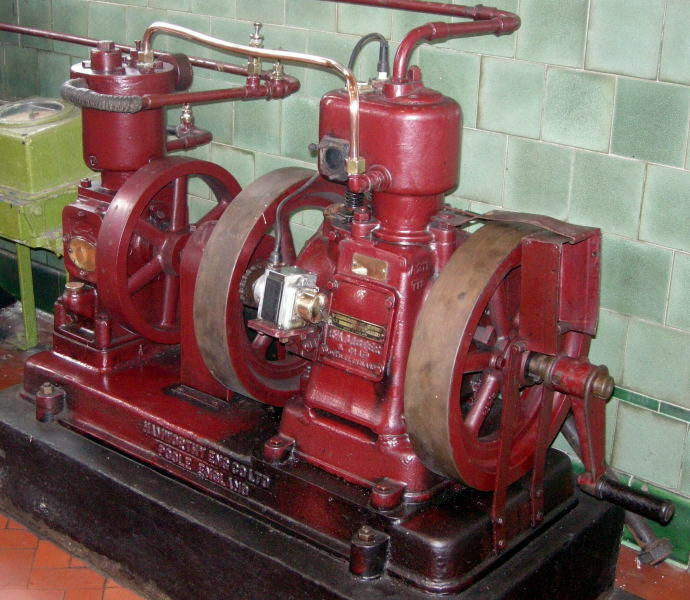 WWII Carried on production of pumps and compressors, much of which was used either directly or indirectly in the war effort. 1953 Ruston-Bucyrus took over the manufacture of the products themselves. 1954 Hamworthy Engineering became a licensee of the Hydreco Division of the US company New York Air Brake. Hamworthy Hydraulics was formed from this association as a 50percent-owned subsidiary of Hamworthy Engineering. 1955 Hamworthy Engineering moved to new premises at Fleets Corner, where 2000 staff members were employed. 1962 Powell Duffryn acquired Hamworthy Engineering Co including its 50percent share of Hamworthy Hydraulics. 1972 Acquired Fuel Furnaces of Birmingham. Prototype Hydralift offshore crane drive delivered. 1974 Mr. John Clarke became the technical director of Fuel Furnaces, Great Barr, Birmingham, a company in the combustion division of Hamworthy Engineering Co, part of the Powell Duffryn Group. 1989 Hamworthy purchased Hydreco shares – the company became part of Hamworthy Hydraulics. Powell Duffryn Group acquired the Hamworthy Hydraulics company. Acquired Airoil-Flaregas and Peabody Engineering broadened the product portfolio. 1993 David Brown Group purchased Hamworthy Hydraulics and Hamworthy Transmissions from Hamworthy Engineering and the production facility of the Transmissions part of the business was moved to the main David Brown facility in Huddersfield. 21st century: Hamworthy Combustion has 800 employees in 18 locations worldwide. This page was last edited on 27 January 2016, at 09:08.